Amanda was born in August of 1988 at Good Samaritan Hospital in West Palm Beach, moving with her family to Palm Beach Gardens in 1993. She attended school at St. Mark's Episcopal School, Howell Watkins Middle School and Palm Beach Gardens High School. She volunteered her time doing activities such as: Big Heart Brigade, Earth Day, feeding the homeless at St. George's Church, an annual participant in the Angel Tree for disadvantaged children, disaster relief aid after the hurricanes, and loved to help young athletes learn the skills that would allow them to grow and become the best they could be. 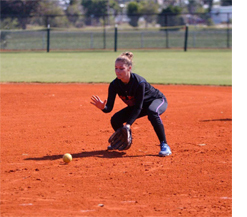 Amanda was a standout athlete in Soccer and Softball throughout her school days in Palm Beach Gardens and across the country while playing in travel leagues during the summer. She took her participation in Fast Pitch Softball to heart during her high school years, defining herself as a clutch hitter and taking the definition of a defensive player to the highest level possible. She was recognized throughout her career in softball as the player you would not want to hit the ball near or to. Her many awards in high school, for all conference, all district, all area were testament to her drive to be the best she could be and the stature to which her peers and coaches held her abilities will always be the benchmark others will try to achieve. She humbly and quietly said that she was very proud to be a member of the first high school softball team to bring her school, her city, her county back to back state championships, but the crowning achievement for her was her ability to be a friend to whomever she met and always keep sportsmanship foremost in her mind. Amanda culminated her high school career with the realization of her dreams to go to college by achieving academic excellence awards through the Florida Bright Futures Program and a full ride athletic scholarship to St. Leo University to play softball. Amanda died a crime victim in July 2007, three weeks short of starting her college career. The Foundation carries on her spirit to help children and families and our volunteers have the same attitude as Amanda, never give up and never stop helping. The Amanda J Buckley "Give A SmileTo A Child" Scholarship is awarded anually to girls who have expressed and demonstrated their desire to be the best both on and off the field. To be considered for a scholarship you must meet the requirements listed. If awarded a scholarship, applicant must complete foundation’s paperwork and any other foundation criteria. Awarding of scholarship will take place during the school year at the foundation’s discretion. Please fill out the application form to be considered for a scholarship.